Olympic sailing success depends on a robust intergenerational recreational sailing population. Period. These data confirm it. After popularity grows, we earn more medals. Soon after popularity falls, we earn fewer. 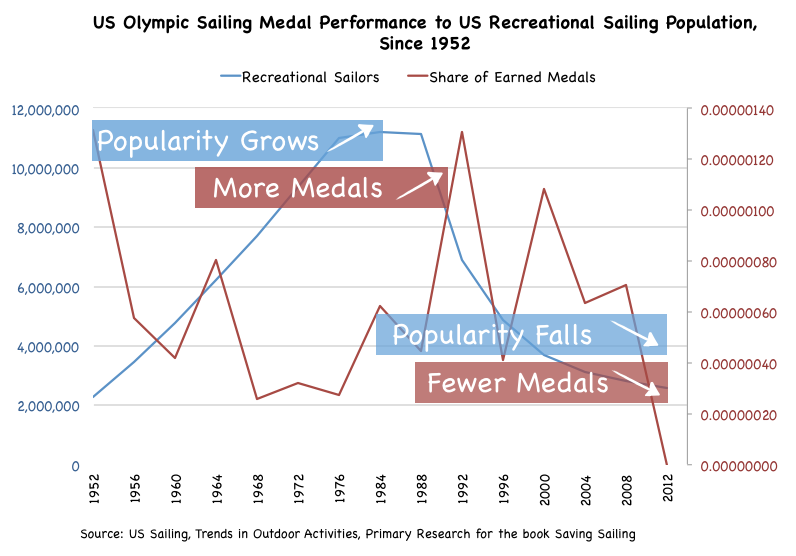 If you compare the number of recreational sailors in the US to the number of medals earned per recreational sailor, you learn that one short generation (15-25 years) after sailing was at its peak popularity in the US, the US was fielding its most talented Olympic sailing teams. Soon after sailing began to fall in popularity, we began to perform more inconsistently, and eventually, we struggled to represent in international competition. Sure, some individuals have been stand-outs, but broadly, our Olympic team needs a much stronger foundation. And sadly, these data confirm that success takes a longer time to cultivate than failure. It’s a bit easier to see the relationship by using polynomial trend lines to smooth the data. Granted, we outperformed between 2000 and 2008 in terms of medals earned per recreational sailor, due, in part, to hangover effects: many Olympians take part in more than one of the games and modern professional training got more from some athletes. But this also means that in those odd years, we were effectively concentrating the most skill in the fewest people. If you had to invent a formula for eventual collapse of a team, that would be it. So this year’s medal shut-out was to be expected. The way to earn more Olympic sailing medals is to build at the base; to share sailing broadly with as many people at the local level as we can reach. #GoSailing. I’ve also been doing a lot of thinking and analyzing on the Olympic medal question and while I agree that building the sailing base (as in lifelong enjoyment of the sport), I’ve also concluded that Olympic sailing is somewhat irrelevant to that end. 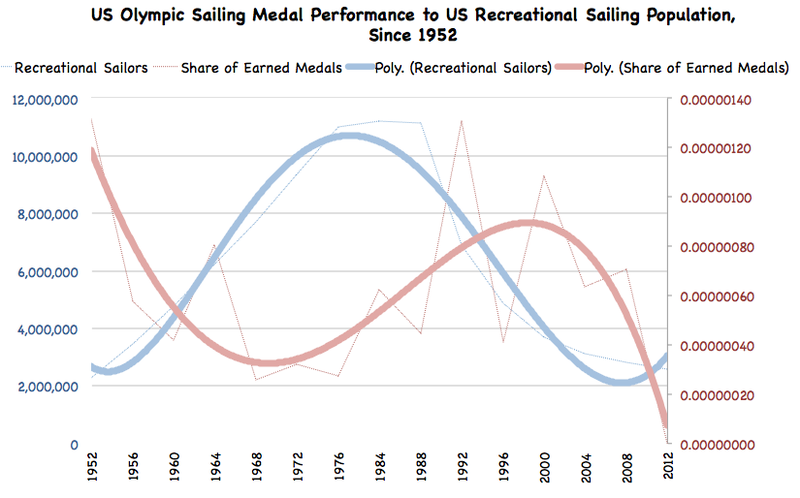 The Olympics represent such a small percentage of sailing athletes and the may or may not represent those who have embraced sailing as a lifelong sport that I have a hard time drawing causality from the correlation. National efforts to gain success at the Olympics really look to me to stress the non-lifetime aspects of the sport. I’m afraid that there will be much hand wringing by US Sailing on this and that we will have more success in medals in the future without building the base. For instance, remove the restriction that ICSA has that forbids member schools from awarding sailing scholarships and change the boats from Collegiate 420’s to 470’s (with traps and spins). Changes like this are more in line with what other countries do… and cost money… But, that tends to be how USA athletics addresses things like low medal counts (throw money at the sport). Anyway, I thank you for bringing up this topic! It will continue to yield some great conversations! You are currently reading Olympians need you to #GoSailing at Saving Sailing.